There can be little doubt that Serena Williams is the best women’s tennis player of this and maybe any era. There could be no finer choice than Serena Williams to light the cauldron at the opening ceremony if Los Angeles wins the 2024 Summer Games. Now the dilemma. By herself? Because maybe there could be an even better choice: with sister Venus, too? Both are Olympic champions. More, both have shown not just great but unwavering commitment to the Olympic movement and, indeed, the Olympic spirit. Most important: the Williams sisters are proof positive that you can dream and big dreams can take you anywhere and everywhere. Isn't that what the Olympics are about? Serena Williams confirmed Wednesday she is 20 weeks pregnant. That means she was already close to two months pregnant when she won her 23rd Grand Slam singles title, the Australian Open on January 28. Understandably, the cauldron suggestion is maybe getting just a little ahead of things, because the International Olympic Committee won’t select the site of the 2024 Summer Games until September 13, Los Angeles and Paris the two contestants, and it’s hardly an overhead slam that LA will prevail. The opening ceremony would be July 19, 2024. That's a Friday if you're, you know, a planner. It would begin with a torch relay down the row of columns of the LA Memorial Coliseum, which played host to the 1932 and 1984 Games. About 70,000 people would likely be in the Coliseum for a Hollywood-style spectacle and virtual reality experience of what’s to come next. The relay would pass landmarks on the streets of LA until it reaches the new NFL stadium, which would hold 100,000 people. Who, at the end, would light the cauldron? Surely there are many — for emphasis, many — luminaries deserving of consideration. Just for starters: Magic Johnson. Allyson Felix. Kerri Walsh. Michael Phelps. Ashton Eaton. Katie Ledecky. Mia Hamm. Abby Wambach. Apolo Ohno. Serena and Venus Williams grew up Compton, California. The LA84 Foundation — the legacy initiative from the 1984 Games, which funds youth sports in Southern California — has underwritten the exact kinds of programs that helped give the Williams sisters their start. 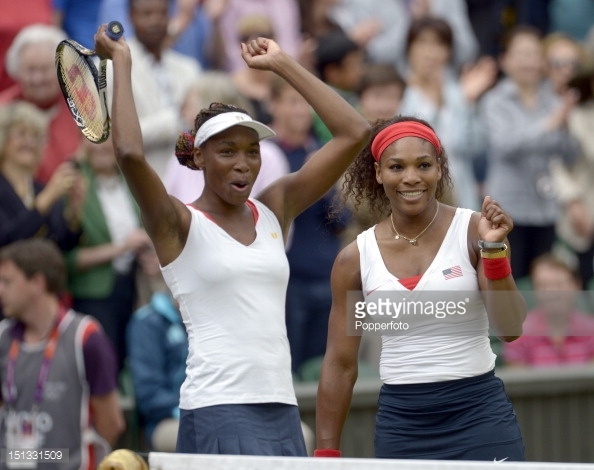 Playing doubles together, Venus and Serena Williams won gold at the 2000, 2008 and 2012 Games. Anyone who saw Serena Williams power to gold in the Olympic women’s singles tournament at Wimbledon in 2012 will tell you: it was a virtuoso performance. In the final, Serena Williams thrashed — just crushed — Maria Sharapova, 6-0, 6-1. The London 2012 victory made Serena Williams only the second woman to achieve a Golden Slam. Steffi Graf won at the Olympics in 1988 after sweeping all four major titles. Remember the dance Serena Williams danced at that medal ceremony after she put on her Team USA jacket? "I don't think I've ever danced like that," she said then. "I don't even know where the dance came from." Remember last year in Rio? When a number of the world’s top golfers were, like, nah, don’t want to go? Serena Williams battled injuries throughout 2016. Where were the Williams sisters during the Rio Games? In red, white and blue, in Brazil, representing the United States. Where, it should be noted, Venus Williams won a silver in mixed doubles with Rajeev Ram, her fifth Olympic medal. Venus Williams is the Sydney 2000 women’s Olympic singles winner. Serena alone at the cauldron? Serena and Venus together? Both are great, and deserving, champions. Both have answered the call for their country. If this moment goes from possibility to reality, and again the disclaimer, it's right now just an if -- it would be a great call for their country, in service to the Olympic dreams of little girls and boys everywhere, to do the right thing on that Friday night seven years from now in July. The campaign for the 2024 (and, maybe, 2028) Summer Olympic Games moves this coming week into its next phase. It’s a carefully structured, overly programmed, International Olympic Committee-directed 10-minute road show. That is, both Los Angeles and Paris officials get 10 minutes (apiece) to present to the 20 or so IOC members due to be in attendance at a sports convention on the eastern coast of Denmark’s Jutland peninsula. That far to travel for that little time and, moreover, to an audience that isn’t even one-quarter of the voting IOC membership? That is not anywhere near, to use a favorite IOC phrase, best practice. Indeed, the whole IOC bid and campaign machinery — theory, structure, implementation — needs a thorough re-do. For years, the IOC has sought to use the “evaluation” process as a means to have cities sell the IOC on their (that is, the cities’) merits. That process needs to be flipped. The IOC ought — better yet, needs, and better still, needs right now — to be asking, what are our (that is, the IOC’s) needs and what city can best fulfill our (again, IOC) needs? It is patently clear to a significant cohort of Olympic watchers -- and some insiders, too -- that the bid process is broken and thus the IOC has arrived at a junction that spells crisis. Change must be effected. The $51 billion questions on the table are whether senior IOC leadership as well as the rank-and-file members a) recognize the gravity of the problem and b) will respond. It is worth noting that it was in the bid context -- see Salt Lake City, late 1990s -- that the IOC suffered its most existential threat. Until, perhaps and again, now. As a result of the Salt Lake scandal, the IOC enacted a 50-point reform program. The Barcelona 1992 Summer Games made presidents, prime ministers, governors and mayors everywhere believe that the glow from an Olympics could similarly jump-start their own government-funded infrastructure projects. The Games come with a fixed seven-year deadline. That means stuff has to get done — airports, metro, light rail and sewer lines and more. That deadline, in practice, has also produced ridiculous cost overruns. Sochi: that reported $51 billion. Beijing: $40 billion. Rio: probably $20 billion. London: $15 billion. Tokyo: bid projected at $7.8 billion, now maybe $15 billion, who knows. Athens: $11-15 billion. Over the past two, maybe three, years, the spiral of media— and in particular social media— reports have come back to bite the IOC in the backside. As this space pointed out in a March 3 column and as Payne noted in his speech last Wednesday, the ever-increasing import of social media means community activists can leverage virtually any local grievance and turn it into as, he said, a debate “about whether to stage an event” such as the Olympics. That’s what brought down the Budapest 2024 bid just weeks ago. And before that the Hamburg 2024 bid. The Los Angeles 2024 effort — the bid and, if it succeeds, a Games — is privately financed. Just like 1984. This is the key difference between the LA effort and just about every other Summer Olympics since the IOC got itself into the jam it now finds itself in. And it unequivocally is in that jam. For public consumption, the IOC is essentially just letting the road show and evaluation process play itself out. Behind the curtains, it is trying to figure out how to cut a 2024/2028 deal between the last two cities standing, LA and Paris. The Denmark road show is being held for the benefit of the international sports federations. Two years ago, this very same sports convention was under the leadership of the judo federation president, Marius Vizer, who was at odds with IOC president Thomas Bach, and no 2022 Winter Games bid-city presentations were allowed, purportedly to cut the cost of bidding as part of Bach's Agenda 2020 would-be reform push. For the past year, the federations have had a new guy in charge, Patrick Baumann, from basketball. Now Paris and LA get to present. It also happens that as of a few weeks ago Baumann is also the head of the 2024 IOC evaluation team. No criticism should be implied or inferred of Baumann (like Vizer, a very smart guy) or the way he ended up leading that evaluation team (long back story) — the point is, how can the Agenda 2020 reforms look anything like but what real life has proven them to be, hollow? Back, of course, to the point of the bid process: personality politics cannot be the basis for a billion-dollar decision. That’s just basic. Similarly, it makes little or no sense to cater to the sports federation officials. Unless he or she is also an IOC member -- they don't vote. The IOC has a distinct credibility problem. A key reason is that it is perceived, appropriately, as the establishment, particularly in Europe, where taxpayers are mightily angered at the spending of their euros on what they perceive, rightly or wrongly, as Olympic waste. So: essentially forcing a bunch of folks to jet into Denmark for two 10-minute presentations? Just to feed the egos of international sports federation leaders? And then everyone goes out to the lobby for snacks and cocktails? The IOC needs to reverse the paradigm. The IOC should not be asking whether (pick one, A, B or C) the archery or badminton or canoeing president likes city x's pretty video. Again, no vote unless an IOC member and, besides, that's in line with this theme — which city can impress us most? In turn, that leads to this kind of question: city x, why is it important to your redevelopment strategy to build an athletes’ village that you have already budgeted at some billion-dollar obscenity that we nonetheless know, because history says so, is laughably low? The IOC is not a redevelopment agency. It is not an urban planner. It is about sport. That is what the Olympic Charter makes plain, time and again. Sport. In the service of humankind. To that end, the IOC should be asking, what is your detailed strategy to connect with athletes and other young people, and not just in your country? Don’t bore us to death with school programs. Tell us about connection and engagement. Tell us something innovative, creative and exciting. Right now, the IOC produces a fat evaluation report filled with answers to questions such as the number of hotel rooms in city x or its airport capacity. These questions are relevant. But they are relevant mostly to IOC staff. This next sentence is critical: the staff does not vote. This logically produces a huge disconnect in the evaluation and thus the bid and the election process. Why? Because the members largely do not care. Again, on issues such as the whether it's the Westin or the Hyatt or runway 26-left or 18-right, the members mostly do not read these reports. So this entire evaluation process, which after Salt Lake is supposed to form the underpinning for the most important decision the members make, is a colossal waste of time, money and resource. If the IOC did that for 2024, there would be only one conclusion. It would be so easy. Crisis solved. Back in the day, a young person who was maybe having a little trouble understanding a concept might meet up with an older fella. This older fella might feel so inclined to help impart some wisdom rather directly by means of what in some parts of the United States might be referred to as a switch. This practice has largely fallen out of favor, given as a switch is pretty much a tree branch and beating people about the head with a stick is no longer considered what we in modern times would call best practice. Actually, we would probably call that a felony. Even so, when it comes to the race for the 2024 Summer Games between Los Angeles and Paris and, now, perhaps the joined-at-the-hip contest for the 2028 Summer Games, too, let us turn for just a few moments to our new imaginary friend, the common-sense switch. This is not difficult. Indeed, the way this is trending it is so painfully obvious. It’s truly simply common sense. Tony Estanguet, the Paris 2024 co-president, gets sent to London earlier this week to meet with a gaggle of reporters. It’s telling that Estanguet is the guy who gets sent to London in the first instance — but let's not digress. Reaction: why adopt a black-and-white, either-or position six months before the purported decision date? Ask any sophisticated business person: how often does an ultimatum prove a successful negotiating position? Jules Boykoff, an American professor, writes an op-ed for the Los Angeles Times loaded with trigger words (first paragraph alone: “profit-gobbling cartel” when the International Olympic Committee is not in the business of turning a profit) that asserts, amid all the glibness, that LA and Paris should press the IOC to assume a larger share of cost overruns. Zero quarrel here with Mr. Boykoff and his focus on reforming certain elements of the Olympic movement. Trigger words get attention. Mr. Boykoff wants to position himself as one of the Olympic voices in academia to turn to. All good. The quarrel here is with my former employer, the LA Times, which didn’t challenge the underlying premises of the piece. A little fact-checking would have made plain what is, again, so obvious — the key distinction between the Los Angeles and Paris plans for 2024, and why, as this space keeps pointing out repeatedly, the IOC would do well to seize the common-sense opportunity right in front of its very face or be prepared to face what the potentially (not being dramatic here) existential consequences. Because, after 25 years of boondoggles, taxpayers in the west are mightily pissed off. The single most important difference between the LA and Paris bids is that everything that matters in Los Angeles is already built. It exists. Now. Oops. OK. Wait. Mea culpa. The new NFL stadium in Inglewood doesn't exist yet. But it's being privately financed in a deal driven by the guy who owns the LA Rams. That's a $3-billion, state-of-the-art stadium for which LA24 organizers would not have to pay anything to help construct. So, thanks, right? Paris would have to build an athletes’ village, media housing and an aquatics complex. Those are big projects, and history shows they inevitably produce cost overruns. They would in Paris. Guaranteed. The Paris bid files (click here, see pages 28-31) project the village at $1.607 billion, the media housing another $373.8 million. Aquatics would be another $158.05 million. Now you're talking over $2 billion. As an AP story noted, there's also discussion of new public transport infrastructure to make the athletes' village more accessible, via a new train station and construction of a road interchange so that you could get to the village from central Paris in 20 minutes, at least in theory, by car. Who wants to guess, when the cash register stops wildly spinning and cha-chinging, what obscenely large number would be in neon-bright digits? And who would end up paying for a big chunk of this? Reality: for credibility purposes, the IOC cannot afford these kind of building sprees anymore, not after 25 years of massive overruns — Barcelona 1992, which jumpstarted the whole Olympics-as-urban-renewal thing, is celebrating its anniversary even now. Compare and contrast: if you don’t have anything to build, why would you have infrastructure cost overruns? This is the LA story. Thus to the central thesis of the LAT op-ed piece? Why would the LA24 people want to challenge the IOC on cost overruns when LA24 doesn’t have logical reason to anticipate even one red penny? Hello? LAT editors -- 17 years for me as a staff writer there and have things really gotten that sloppy in the 10 years since I left Spring Street? Paris is largely a government project. LA is privately financed. Because LA is a private deal, just like it was in 1984, there is no margin for error, no room for costly boondoggles. Indeed, LA 2024, early on, considered the construction of a new athletes’ village near downtown Los Angeles. But officials decided not to do it. Why? Because it would have been too expensive! Instead, completely in line with the purported reforms known as Agenda 2020 championed by the IOC president, Thomas Bach, LA 2024 turned to the existing dorms at UCLA. Which are world-class. You know what else is really fascinating in that survey? Here, for instance, you see that the Montreal 1976 Games incurred a 720 percent cost overrun. You know what’s missing from this chart? Los Angeles 1984. Totally not there. Turn, please, to page 25. There the authors have referenced the LA 84 official report. Now turn to page 309 of that official report, section 11.01.10, “Revenue and the operating surplus.” There it says the LA84 organizing committee turned a surplus — attention, LA Times editors, when referring to non-profit enterprises such as the IOC, it’s “surplus,” not “profit” — of at least $215 million, perhaps as much as $250 million. The final number, as history would prove, was $232.5 million. Since, through the LA84 Foundation, millions upon millions of dollars have gone into the promotion of youth sport around Southern California. That is real Olympic legacy. Grenoble, France, 1968 Winter Games, cost overrun: 181 percent. Albertville, France, 1992 Winter Games, cost overrun: 137 percent. The California legislative analyst’s office, the state legislature’s nonpartisan fiscal and policy advisor’s arm, issued a report Thursday on the LA24 bid that could not have been more — common sense. The state, like the city of Los Angeles, has an interest in protecting taxpayers. The reason taxpayers in and around Southern California have repeatedly proven so high on a return of the Games to LA is the consistent belief that a privately run Games will not dent their wallets. That's just — common sense. Let’s once more compare and contrast, because unlike the LA24 people, our Paris 2024 friends would indeed have to guide “big Olympic infrastructure projects to completion,” the biggest that athletes’ village. Last week saw a building and property trade show in Cannes (that's the sun-splashed ville where they do the film festival). It was called MIPIM. Who put up a booth? This is itself interesting, since the idea of the stand was to attract private investors but the Paris bid book makes plain that "government" is, for the athletes' village, the "body responsible for funding venue from construction until Games time." At any rate, maybe the way you go about attracting investors and financing in France is different. In the United States, you would call, say, Goldman Sachs or some other heavyweight for a project estimated in the billions. There, it’s a booth at a trade show. What, did our Paris 2024 friends give away pins? Better yet -- some of those 1.5 million Paris 2024 cloth bracelets (2 euros apiece!) that 18 months ago were touted as a crowdsourcing funding vehicle. Maybe a few are now left over? "This is an opportunity to reduce noise pollution, by creating noise-barriers along the A86 expressway (a major local highway), but also to decontaminate the soils and to place underground the EDF (French utility) electric networks and lines." This is what an Olympic Games is supposed to be about? Soil decontamination? Noise barriers? Utility lines? Or a fun, successful event? The International Olympic Committee, like the Kremlin, speaks in code. Let us now decode Friday’s announcement from a meeting in South Korea of the IOC's policy-making executive board that a “working group” made up of the four IOC vice-presidents has been set up to "explore changes" in Olympic bidding. The obvious subtext: the possibility later this year of jointly awarding the 2024 and 2028 Games to Los Angeles and Paris or, you know, Paris and Los Angeles. This panel is due to make its report at what is called, in IOC jargon, the “technical briefing” in mid-July in Lausanne, Switzerland, the show at which those two candidate cities get to make presentations before the big event itself, the September 13 vote — if there is going to be a vote — in Lima, Peru. The announcement Friday comes as IOC confronts almost everywhere it looks what in gentle terms would be called a credibility gap. The IOC stands as the symbol of an establishment that regular people increasingly resent, and a lot. These regular folks, who in western democracies are taxpayers, have made it plain that they will accept the IOC only on certain terms. Meaning their — taxpayer — terms. Which means back to the future. Which means 1984. In this volatile and perhaps even existential moment for the Olympic movement, you know the sort of thing that further erodes IOC credibility, and in a big way? The place Mr. Kasper is from is a canton in Switzerland where sits St. Moritz, site of the 1928 and 1948 Winter Games. There, twice in the past four years voters have been asked via the ballot whether they would be interested in staging the 2022 or 2026 Winter Games. Twice the answer, most recently during the 2017 alpine ski championships: no. Mr. Kasper’s words were so offensive and ill-timed, given everything at stake, that the IOC itself issued an apology on his behalf. It is with this sort of ever-shifting and complex backdrop in mind that one approaches a more subtle decode of IOC "working group" messaging. Whatever the IOC president wants is what the “working group” will “present” in July. This is the way the IOC works. Now, then, presumably always. If you don’t understand this basic premise about the IOC, you are still charmingly enrolled in naive school, which is fine but not the way the Olympic sphere operates. The current IOC president, Thomas Bach of Germany, learned this from Juan Antonio Samaranch of Spain, president from 1980-2001. Outsiders hold to a stereotyped perception of Mr. Samaranch. The long view of history is more likely to trend toward a keen appreciation of Mr. Samaranch's style and manner of global leadership. The four vice-presidents do not come to the table as neutrals. Australia’s John Coates has every reason to push a Brisbane bid for 2028. Turkey’s Ugur Erdener, same for Istanbul. Spain’s Juan Antonio Samaranch Jr., absolutely for Madrid. Then there is China’s Zaiqing Yu, and after Beijing for 2008 and 2022, why not Nanjing (Summer Youth Games 2014) or Shenzhen (Summer University Games 2011) or Shanghai for 2028? Coates, Erdener and Yu are already on record as publicly opposed to the idea of a 2024-2028 double-double. Others who have said an Olympic double, hold the fries, may not make the best option: Gerhard Heiberg of Norway, the former IOC marketing director, and C.K. Wu of Taiwan, another executive board member and the boxing federation president. That such heavyweights do not come as neutrals? Does not matter. With the announcement of this “working group,” the executive board bought itself roughly four months for Bach to canvass the Olympic scene’s wide range of stakeholders on the notion of a 2024-2028 double. In this case, canvass is again code. It means, from the IOC president’s position, sure, I am glad to listen to you. Done? OK, now my turn, and be sure to listen closely, please, because we are facing some issues and we need to find a solution. Mr. Bach, meanwhile, is walking a tremendous high-wire act, which he and perhaps only a few confidantes truly understand. 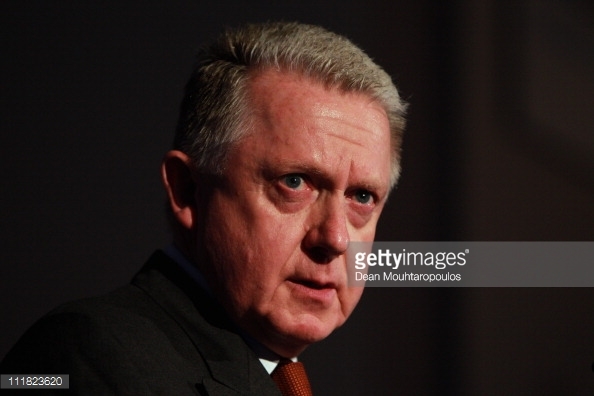 In December 2014, Mr. Bach pushed through the IOC membership a purported wide-ranging reform plan dubbed Agenda 2020. As evidence that the IOC does what the president wants: Agenda 2020 (all 40 points) was approved unanimously. The reforms have so far failed to convince taxpayers in any number of European cities that they are in the least bit meaningful, leaving only two candidates in the 2015 vote for 2022 (Beijing and Almaty, Kazakhstan) and, now, for 2024 (LA, Paris). A good many of the members already complain, if not for attribution, that being a member might make for a great way to speed through passport lines but what else? Being an IOC member is entirely a volunteer position. It carries no defined mandate. A member’s key “job” has in many ways been reduced to voting in the candidate city elections. And now, for 2024 and 2028, the IOC president would take that away? Even more, for the 2022 Games race just two years ago, the situation was exactly the same — two cities — and yet the members duly exercised their franchise? In discussion about a 2024-2028 double, this space has made plain that the only way such a twist would work is that if it were LA for 2024, Paris for 2028. Some European friends have floated the idea of Paris first, LA for 2028. Our Paris bid friends suggest that it would have to be Paris first in any such rotation because the tender for the land on which an athletes’ village would have to be built is only available for 2024. If past history is a reliable guide, and it is, the village would indisputably sink into a fat and ugly construction cost-overrun and delay-plagued boondoggle. To reiterate, that is the very last thing the IOC — and beyond, the broader Olympic movement — wants or needs. What all involved want and need is time and stability. At any rate, if that tender is the sticking point, French friends: if it’s that critical to your project, get a better lawyer. That is just common sense. Maybe, you know, find a way to figure out how to make it happen instead of saying, all French-like, non, we cannot. Mr. Bach was elected to a first eight-year term in 2013. Let’s say for purposes of discussion that the IOC’s fascinatingly insightful new friends in the French prosecutor’s office, having already reached out to Frankie Fredericks, the IOC member from the west African nation of Namibia, don’t so intrude on Mr. Bach’s fate that he can fulfill not only that eight-year term but can, indeed, serve — as is IOC custom since the reforms associated with the late 1990s Salt Lake City affair — a second four-year term as president. Math: the year 2013 plus 12 would take us to the year 2025. Agenda 2020 is Mr. Bach’s project. He is hugely invested in, indeed professionally identified with, making it real. Assuming 12 years in office, the only Summer Games on Mr. Bach’s watch during which Agenda 2020 could be seen through, start to finish, would be 2024. Of the two bids, the only Summer Games that even remotely aligns properly with Agenda 2020 is Los Angeles. The Paris people may well protest. They say that 95 percent of their stuff is already built, and good for them. The IOC president would never, ever — repeat, never, ever — say in public that big-ticket items like these are, in fact, killers. Sports politics is absolutely politics, and you do not get to be the IOC president without being an adept politician of the first order. But, and he knows this, the IOC absolutely needs to get out of the government-backed project business. That’s not what the Games are about. It perhaps may have been little noticed except within certain Olympic precincts but last week offered up 110 percent evidence to that exact point: why the IOC desperately needs to get out of the business, at least for a safe-harbor seven-year stretch, of having sports events essentially backed — as Paris is and Los Angeles is not — by government. There's something of an irony here: the IOC held its 2011 assembly in Durban, South Africa, and it was there that the IOC elected Pyeongchang, South Korea, the site of the 2018 Winter Games, which was where the IOC announced Friday it was going to have this "working group" all about 2024 and 2028. This comes of course just a few weeks after Budapest dropped out of the 2024 Summer Games campaign — following earlier exits by Rome and Hamburg, Germany. It’s just so obvious what is what. As in 1984, the LA 2024 project would be privately financed. That’s what these next four months, and the behind-the-scenes talks, will be about while the "working group" does its thing. At that meeting in Korea, the Games’ executive director, Christophe Dubi told a small pack of reporters that the Summer Games last year had “changed the sewer system” in Rio de Janeiro. First and foremost, an Olympics is not now, was not then, will not ever be about changes to a city’s sewer system. To appropriate one of Mr. Bach’s pet phrases, that is not what gets 16-year-old would-be surfing and skateboarding couch potatoes off the couch. Secondly, with all due respect for Mr. Dubi, who is a fundamentally decent guy whose position often puts him between a rock and a sewage outlet, so to speak, that assertion simply cannot be true. Each and every day in Rio, on the way into the Main Press Center, thousands of us were welcomed by the delightfully fragrant, indeed welcoming bouquet of an open sewage trench. Decode: let’s cut the crap, people. For 2024, Los Angeles. That buys time and stability, and access to the key youth demographic and the buzz and tech of California, and all those things are critically what's at issue, as well as perhaps the chance for Mr. Bach to see his reforms put into action while he’s IOC president. If Paris wants 2028, that’s altogether another matter. Some good lawyers can work that out.